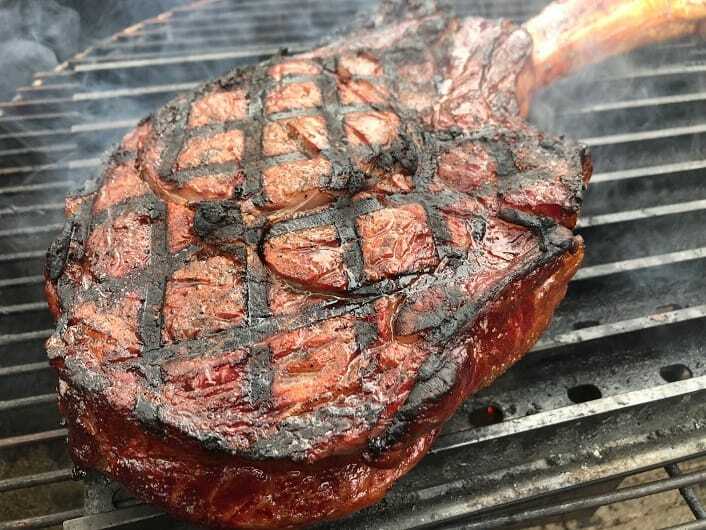 The Tomahawk Steak just might be the King of all Steaks. Let’s take a look a what this beauty is, how to grill it and where you can buy them online. What the Heck is a Tomahawk Steak? 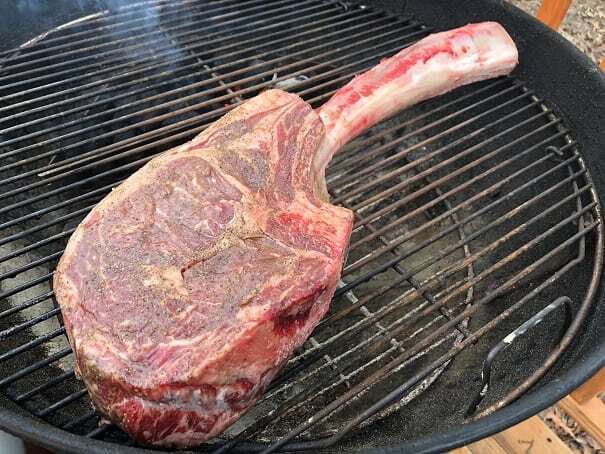 On one level a tomahawk is simply a ribeye steak that is still attached to the rib bone. The rib bone is pretty wide so you end up with a very thick cut steak. These steaks come from the Rib section on the steer and are prized for their combination of incredible flavor and tenderness. 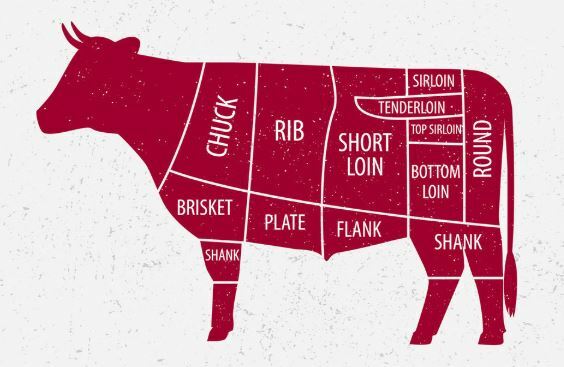 Here is a great video that shows where this steak comes from and how it relates to the other ways of cutting rib steaks. 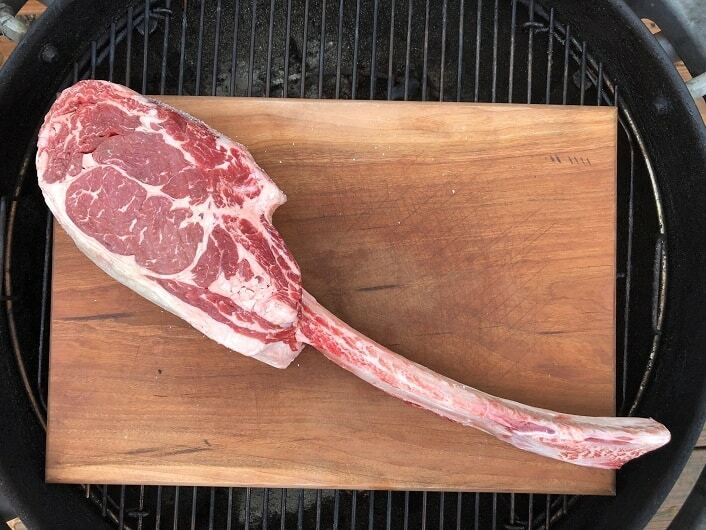 On a different level a tomahawk is a primal showpiece that, when grilled properly, can bring the house down. 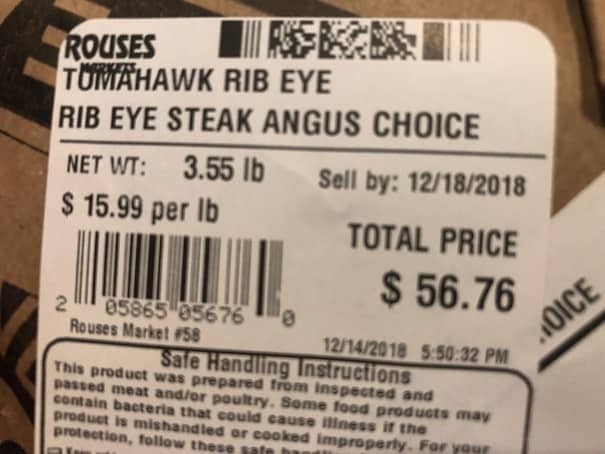 When I pulled this out of the refrigerator my nearly vegetarian wife was amazed and wanted to know what that amazing steak was. When I pulled this steak off the grill my formerly vegan daughter gave an audible gasp. If you want to put on a show then a Tomahawk is the way to go! 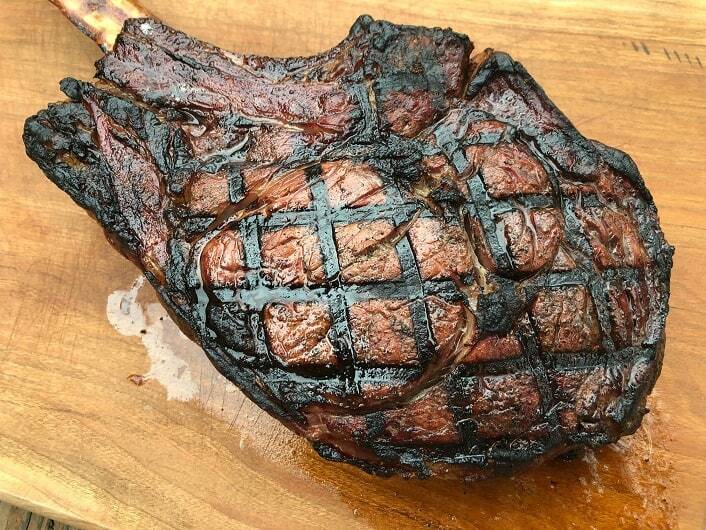 Although this steak looks massive and intimidating it is actually very simple to grill. The key is to keep things simple and don’t be in a hurry. Start by seasoning the steak liberally with salt and pepper. You want to use more seasoning than you are comfortable with since the steak is so thick and the interior ins’t getting any seasoning. Let the steak rest at room temperature for at least one hour and preferably for 90 minutes. Don’t worry, the steak will not actually reach room temperature or start to go bad. You are just letting the steak warm up some so it will cook more evenly on the grill. 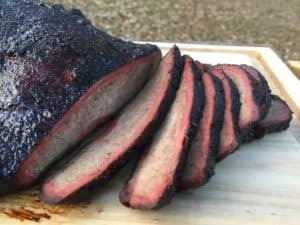 Set up your grill for Indirect Low Heat. On a charcoal grill you would have a small pile of lit charcoal banked on the far side of the grill. On a gas grill you would have one burner on Medium and the rest turned off. You will want the temperature at the grate to be in the 250-275F range. Place the steak on the cool side of the grill (away from the heat) and close the lid. Let the steak slowly grill for an hour and then check the internal temperature. This one was at about 100F an the hour mark. Flip the steak and allow it to cook until it reaches an internal temperature of 125F (this took about 30 more minutes). It will start taking on some beautiful color! Once the steak reaches 125F remove it from the grill and cover with Aluminum foil. The steak is NOT done at this point. We are letting it rest for 10 minutes while we turn up the heat on the grill to scorching hot so we can put a beautiful sear on this bad boy. I added fresh charcoal to my kettle, opened up all of the air vents and let my GrillGrate panels get up to about 500F. Sear the steaks for about three minutes per side or until the steak reaches an internal temperature of 135F. 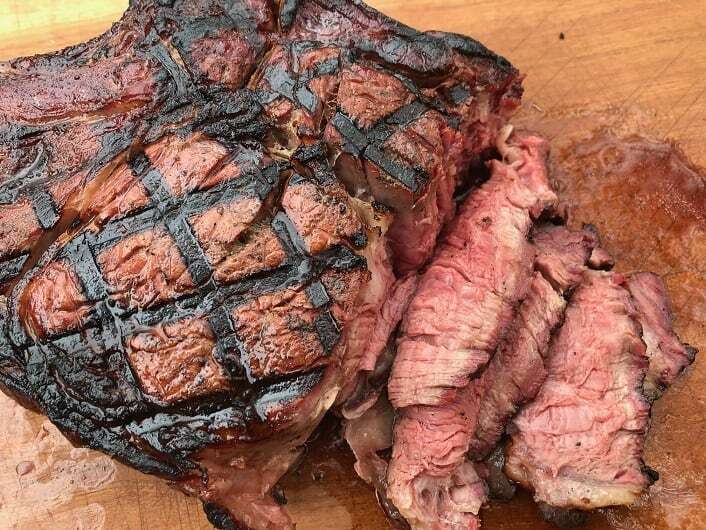 Once the steak reaches 135F (or your preferred level of doneness) remove it from the grill and stand back as your guests applaud your masterpiece! This is a tricky cut to find and expect to pay a premium when you find it. I have a local grocer that routinely carries this cut and they charge around $16 per pound for Choice. I have never seen these for sale at Sam’s or Costco. If you don’t have a good local butcher then your best shot is buying online from Snake River Farms. Snake River offers some of the best beef in the country and they have seriously high quality tomahawks. These steaks come from Prime Grade beef which is a highly quality of beef than the Choice I have at my local store. In addition to being Prime they have also been dry aged for at least 30 days for increased tenderness and a more nutty flavor. These are available as either 1.5 or 2.5 pound cuts. Click here for Dry Aged Prime Grade Steaks. These steaks come from Waygu cattle that have a higher degree of marbling than Prime. Waygu is essentially the American equivalent of the ultra luxurious Kobe beef. This is some of the highest quality beef in the world. The steak is available in a 2.5 pound cut and has been wet aged for 28 days. Wet aging is not as powerful for flavor development as dry aging but it still increases tenderness. Click Here for Waygu Steaks. 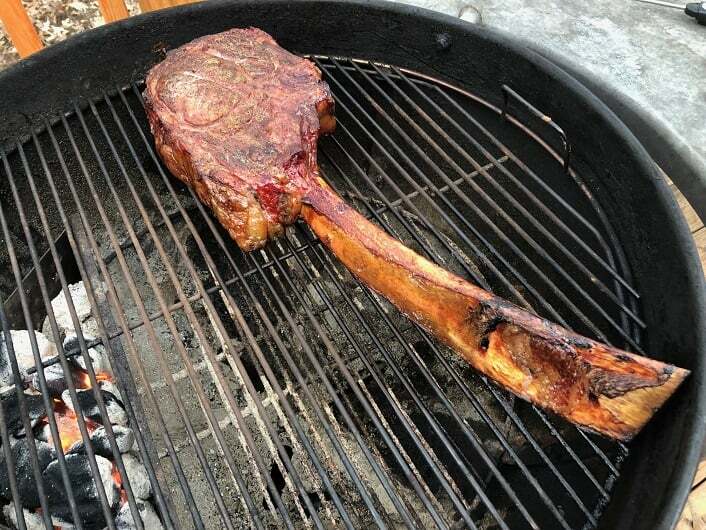 This is quite simply the best tomahawk steak for sale in the world. Snake River Farms has taken the highest quality beef (Waygu) and dry aged it for over 45 days. The depth of flavor you get from 45 day dry aged beef is unlike anything you have ever experienced. If you are ready to run with the big boys and don’t mind paying for quality then this is what you want. Click Here for 45 Day Dry Aged Waygu Steaks.